France's violent 'yellow vest' protests are about much more than a fuel tax. But is President Macron listening? The French government doesn't seem willing or able to defuse the current situation. This weekend, Paris braces itself for the fourth round of gilets jaunes (yellow vest) protests, the French anti-tax social movement that has been growing since mid-November. After last weekend, which saw the worst unrest in Paris in decades, French authorities are still struggling to contain the movement or address its demands. In panic mode, the French government appears to be accumulating mistakes, from tone-deaf declarations to police violence, seemingly unaware of the public indignation these missteps are fueling. The first signs of social unrest emerged in late October, shortly after the announcement of a new tax on diesel fuel. The tax is part of President Emmanuel Macron’s big plan to tackle climate change. For French people living in rural and peripheral areas of the country, people who depend on their car to live and work, this tax was the last straw in a series of fiscal policies seen as unjust and favoring the upper classes. In response, fed-up citizens organized blockades on roads, roundabouts and highway tolls around the country. In panic mode, the French government appears to be accumulating mistakes, from tone-deaf declarations to police violence, seemingly unaware of the public indignation these missteps are fueling. The protests are symbolic — participants have worn the neon safety vest all French drivers must have in their cars — and politically savvy — slowing down traffic had an immediate economic impact. The movement united 282,000 people nationwide on November 17, the first day of the protests, and 166,000 people a week later. But while the fuel tax was the initial pain point, these protests aren’t really about gas; they are about French financial woes more generally. 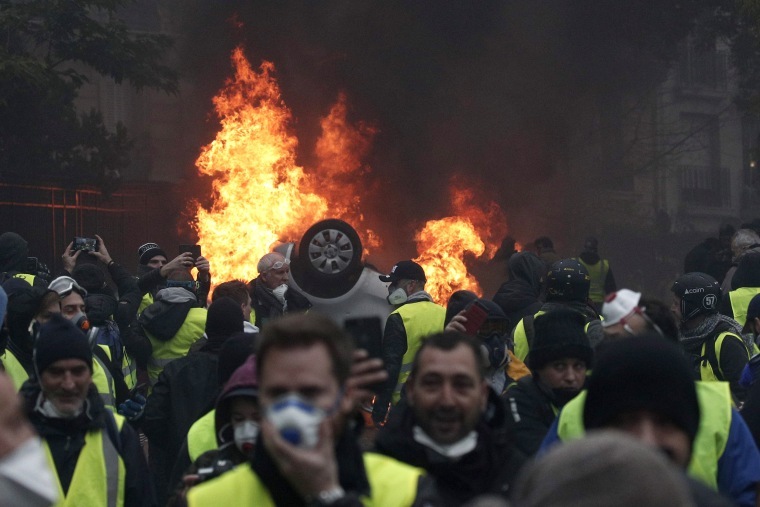 “[The elites] worry about the end of the world while we worry about the end of the month,” Jean-Marc Mourey, a gilet jaune in eastern France told Le Monde. Addressing the protestors on November 27, Emmanuel Macron promised he would “take care of both” the end of the world and the month — but did not say he would rescind the tax. The French president, elected in 2017 on a neoliberal platform, had until then seemed impervious to criticism; the new labor laws in September 2017 and the reform of the rail system earlier this year both were met with protests, but Macron hadn't budged. This is clearly no longer the case, as the darling of the Western press has found himself under attack by violent “hooligans” hurling projectiles, erecting barricades, burning down cars and breaking into shops. On the Arc de Triomphe, the arch on the Champs-Elysées, protestors spray-painted a demand that Macron resign. Macron hasn’t said a word to the French people since. It was his prime minister, Edouard Philippe, who declared that the fuel tax would be suspended for six months — a measure deemed too little, too late by protesters who refused to negotiate with the government. Then the tax was purely scrapped, but this wasn’t enough, either. The protesters, who are of all ages, professions and political factions, don’t seem to want to back down. “I’m prepared to spend Christmas protesting at this roundabout,” one told The Guardian. They want a more equal political and fiscal system, including the reintroduction of the tax on the mega-rich (from 0.5 percent to 1.5 percent, starting from incomes worth more than €800,000), which Macron abolished after his election. Crucially, they want Macron, also known as the “president of the rich,” gone. Violence has gradually increased on both sides in the last week. With some calling for Saturday’s protesters to “march on the Elysée” and using violent French revolution imagery, the French government, now desperate to stop the movement, is walking a dangerous line. The government is right to be worried. Aided by social media platforms like Facebook, various other groups have joined in the social discontent, from truck drivers’ unions calling for strikes to students and high schoolers holding blockades to protest Macron’s education reforms. At the same time, confrontations on the street have become more brutal, and the police more repressive. An elderly woman died after a police grenade exploded near her; students have been severely hurt by police shots; a young woman peacefully asking the police for a truce was sprayed with tear gas at arm’s length. Indignation about the government’s response shot up even further after the arrest of 153 teenagers at a high school in Mantes-La-Jolie, near Paris, on December 6. The youth were forced to kneel down, hands on their heads, in a humiliating posture, as police officers filmed and commented, “What a well-behaved class.” They were also detained without a lawyer, which is illegal for minors in France. The scene has since been reenacted by high school protesters around the country. The French government has said it fears that violent protesters will come to Paris on Saturday to “destroy and kill,” and it has therefore taken “exceptional” measures. A reported 89,000 police officers will be deployed around the country, with 8,000 officers and a dozen armored vehicles in Paris alone. Many Parisian shops, restaurants, museums and monuments including the Louvre and the Eiffel Tower, will be closed, and four football matches have been cancelled. If protesters fire, they will be fired upon, a general has said. It’s true that a fringe of the movement has grown extremely violent. Meanwhile once again, on roundabouts around the country — where it all started — the pressing financial concerns of the majority of the gilets jaunes are being ignored. If the French government wants to defuse the situation, it must do two things: respectfully engage with the peaceful factions and offer some solutions, and also to control the most brutal fringes without matching their violence. Right now, it's unclear whether they will, or even can, achieve either. Pauline Bock is a French journalist and contributing writer to the @NewStatesman. Her writing has appeared in various other places including the Guardian, The New York Times, New Yorker and Wired.